Lydia Aiken has had a longtime interest in other cultures and compassion for people from different backgrounds. And when she graduates from Missouri S&T, she hopes to carry that compassion and understanding into a career with the U.S. Foreign Service. The U.S. Foreign Service’s 15,000 professionals carry out the foreign policy of the United States and aid U.S. citizens abroad. 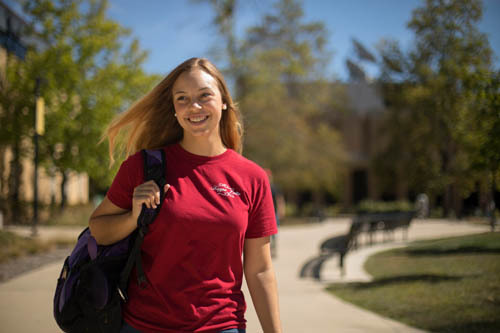 Aiken, a senior in psychology with an emphasis in leadership, says that Missouri S&T has prepared her well for her post-college life and career. This past July, she participated in a two-week study abroad trip to Nicaragua. During the trip, Aiken took immersive Spanish language lessons from Nicaraguan instructors and listened to guest lectures by local experts on Nicaraguan culture, history and technology. She even helped build a cooking oven for the local community. The trip was a requirement for Aiken’s global studies minor. “If I can get on Facebook and chat with somebody that’s on the other side of the world, shouldn’t I know something about them and their culture?” Aiken says. For her capstone course, Aiken took Cross-Cultural Psychology with Merilee Krueger, associate teaching professor of psychological science. The course reinforced Aiken’s long-held belief that just because some people are different than you, it doesn’t mean you should fear them. Aiken realizes that the world is getting smaller, and wants to do her part to make it a more peaceful and understanding place.